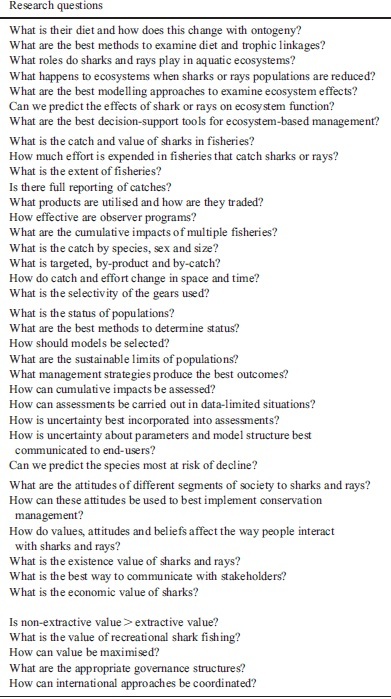 This new paper contains a thorough description of pressing research needs for shark conservation, as well as a table (reproduced below in its entirety) listing important research questions. 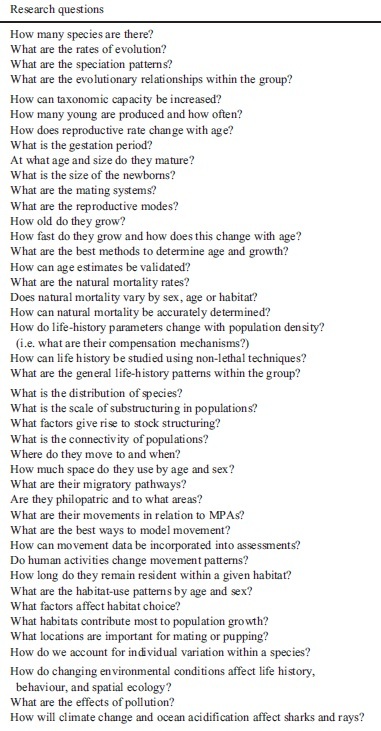 The long list of more than 80 research questions may appear daunting. However, don’t despair! All this means is that no one researcher or technique can get the data we need to save sharks and rays. The future of these animals will depend, as it always has, on a large number of people working on many different projects; people who share a common goal and often work together, but who each focus on a different piece of the puzzle. I am happy to report that there are indeed many smart, passionate people all over the world working to address most of these questions. In many cases, a single research project can focus on many of them- for example my Masters thesis addressed 3 of these research questions for sandbar sharks, and my Ph.D. dissertation has the potential to help resolve as many as 15 for certain species. For their excellent contribution to shark and ray conservation, I am pleased to announce that I am awarding this paper and it’s authors the first annual WhySharksMatter “Most Important Shark Conservation Paper of the Year” award! Congratulations to Colin, Will, Michelle, and Nick! The award comes with a certificate and a beer the next time I see you at a conference! As for the rest of our readers, I have a challenge for you: Look through this table and see if you can think of a single important research question that isn’t included in some form or another. I sure can’t think of very many. A great paper Colin–has provided a platform for our ongoing and future research. Great paper, certainly plenty of work to be done! As my BSc dissertation I am investigating the knowledge, attitudes and fishing practices with regard to shark in UK recreational anglers. I will certainly be citing this paper and some of the others from the conference. Great list and great paper! I am by no means an authority yet, but recent research seems to suggest social dynamics for some species, therefore, what are these, to which species do these apply, and what happens when these are disturbed. What recent research are you referring to, Jeanette? There was a show recently on NGC where they were saying they believe whites are not believed to be as solitary as once thought, but it was kind of open-ended, as is this just behavior during a feeding event or is this a coming together when they are migrating TO feeding events with the resulting social implications. What caused them to make that statement I don’t know. But last year I came across some papers when I was searching for info on their preferred depths for migration…I just remember it because the whole idea of it caught my attention….I will dig for those papers because I find the whole idea interesting,and I will get back to you on that with the references.